Creating ambiance is crucial. Sterno Candle Lamp has created a rechargeable candle system that is space saving, cost efficient, versatile, and flameless. The new Lumina FX2 rechargeable candle set from Sterno CandleLamp is a system that can help any end user set the perfect ambiance. The system comes with a remote for setting options including four flame colors, bright/dim light or flicker mode. Candles can also be preset to stay lit for 4-10 hours. After an initial one-time set up, each Lumina Fx2 can burn for up to 18 hours while only requiring four hours of charge. Each charger rack holds up to 12 candles. The racks can be stacked three high on a single plug. Sterno recommends that the candles are used in lamps at least 4.5″ tall. 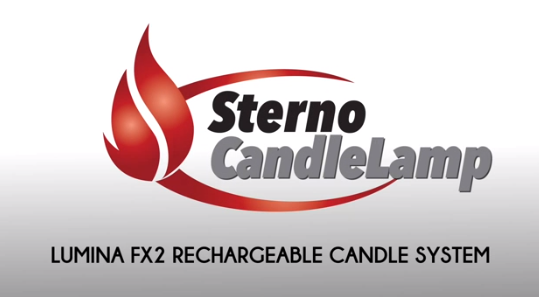 If you’d like more information on the Lumina FX2 from Sterno CandleLamp, click here.